Last week, on Force Friday, Disney unveiled the BB-8 Droid by Sphero- a miniature, fully-functional, radio-controlled robot based on a droid of the same name from the upcoming film, Star Wars: The Force Awakens. It’s described as being “as authentic as it is advanced”, capable of acting independently as well as being controlled directly through a companion app, responding to voice commands, and even has “an adaptive personality that changes as you play”. The internet, unsurprisingly, went nuts when the BB-8 was unveiled. The #BB8 hashtag on Twitter is full of people who’ve bought it talking about how cool it is, or people who haven’t talking about how much they want one. Early reviews are largely positive: Tech Radar said their “first impression of this little droid an overwhelmingly good one”; Forbes said that “BB-8 is terrific fun, he’s a great toy, an amazing piece of movie memorabilia”; CNET cashed in on a well-worn joke by saying that it’s “the ‘Star Wars’ toy you’re looking for”. Me? I’m not sure about the whole thing. Not because I don’t think Sphero’s BB-8 doesn’t look incredible – it really does – but because I have no attachment to BB-8 as a character. It looks cute, sure, but until The Force Awakens comes out, we know nothing at all about this little droid. “Yall don’t even know what #BB8 is gonna do in the movie yet,” @DaveOshry wrote on Twitter. “What if he rolls around and yells racial slurs? Gonna have some buyer’s remorse.” I don’t imagine this is likely, but we know very little about BB-8 at this stage. What if it turns out to be this film’s Jar Jar? Or *shudder* Olaf the Snow-dweeb? No, it’s far to early to drop $280 on an admittedly cool toy about a character we knew nothing about. There’s another little, round, adorable robot that we do know about, though. Gortys, from Telltale Games’ Tales from the Borderlands. 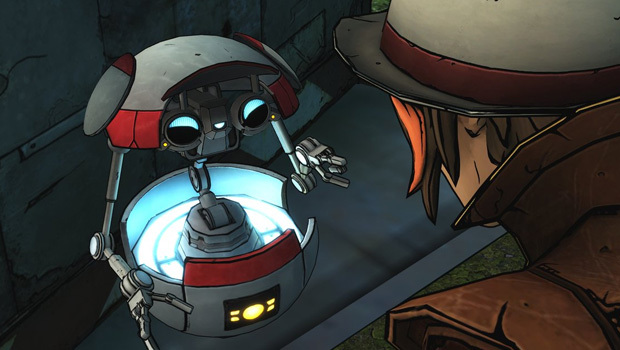 Introduced in Episode 3: Catch a Ride, Gortys is a wonderful, cute-beyond-words robot voiced by the fantastic Ashley Johnson. She stole the episode completely, and is one of the highlights of a series that’s been overwhelmingly good. This is the droid I’m looking for, not BB-8. Now, Gorty’s construction is different to BB-8. She’s mostly spherical (at least to start with…), but moves around on a single wheel jutting out the bottom, a bit like the Borderlands‘ series other popular robot, Claptrap. Her head is the top part of the sphere, which lifts out to reveal eyes and arms, as opposed to BB-8’s being an attachment on top. These are merely details; Sphero could work out how to make Gortys’ construction work. The important part? We know that Gortys is adorable, clever, funny, and lovable. BB-8 might be all these things. Or it might be a Jar Jar, or an Olaf, or a racist. Even if BB-8 is as cute as we’re all expecting, the chances of it being as adorable as Gortys? Pretty slim, I’d say. I’ll admit, I want a BB-8 (if anyone wants to give me one, please contact me!). But it’s not something I’d drop $280. But a Gortys toy built with the same technology? I’d buy that in a heartbeat.